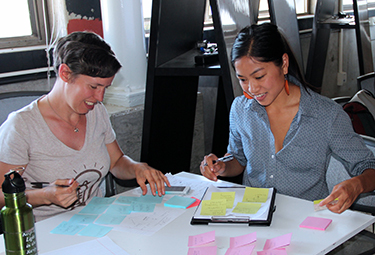 Eat.Think.Design: Public health course brings innovation to the table | Eat.Think.Design. It’s 4:30 a.m. on a Wednesday in March, and students enrolled in Eat.Think.Design. 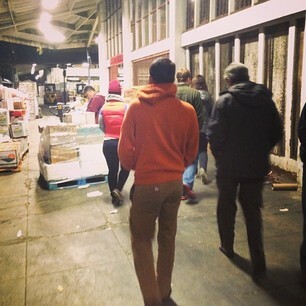 are exploring Oakland’s wholesale produce market in Jack London Square. As the forklifts carry crates of fruits and vegetables and workers do their usual loading and unloading, the students take note of how the morning ritual flows and how it can be done better. 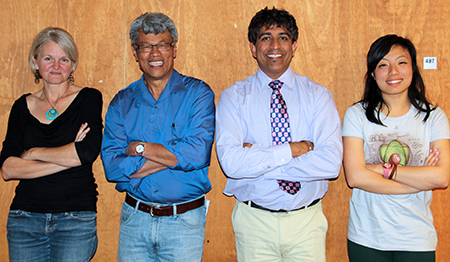 “We emphasize out-of-class learning,” says Jaspal Sandhu, a lecturer at the UC Berkeley School of Public Health, who has been co-teaching the PH290 course every spring semester since 2011 with Dr. Nap Hosang, lecturer and director of the School of Public Health’s On-Campus/Online Professional MPH program. “I read his [Jaspal’s PhD] thesis and it became clear to me that one of the things we could bring to the School was design theory and human-centered design approaches to solution finding,” says Hosang. Sandhu is a partner at Gobee Group, where he focuses on service innovation and technology design in public health. He agreed to accept the challenge after a bit of cajoling from Hosang, and together they set about designing a course. What they came up with was PH290: Designing Innovative Public Health Solutions. The course utilizes problem-based learning and urges students to create unique approaches to solve common public health problems. When not out in the community, students convene at the Cal Design Lab in Wurster Hall, an experimental studio space that promotes hands-on, interdisciplinary design activities. The classroom feels like a start-up office: there’s a constant exchange of ideas, there are white boards with lists and charts, and sticky-notes reign supreme. Eat.Think.Design is very popular with Berkeley students in many majors beyond public health, including architecture, engineering, business, and public policy. This diversity of expertise makes it a hotspot for cross-disciplinary idea exchange and a chance for students to expand their horizons. Take, for example, Orianna DeMasi, who is pursuing a PhD in computer science and enrolled in the course after receiving a recommendation from another engineering student. Her project group is working with Clinton Health Access Initiative to help treat childhood diarrhea in Uganda and East Africa at-large. After three years it was clear that Sandhu and Hosang had tapped into an unmet need. The course was well received and word spread about the public health class that thrived on interdisciplinary dialogue. And, in keeping with the spirit behind the class, just when everything was going well, the curriculum was revamped. This semester the course explored the theme of food. The topic was partly inspired by the number of nutrition students who took the course last spring. Another motivation was Sandhu’s desire to focus on a subject that he felt wasn’t getting enough attention. “We have entire silos that do nothing about the food system,” he says. Given the new focus, they invited Dr. Kristine A. Madsen, assistant professor in the Joint Medical Program and Public Health Nutrition. “I saw this as an opportunity to learn more about design innovation with the hope of taking it back to my research,” says Madsen, noting that it has also influenced how she teaches her other courses. 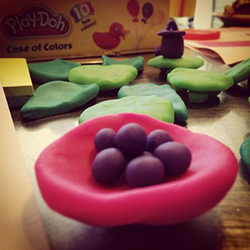 So what does it look like to teach innovation? First, students are required to come to the table with grand ideas. Next, students prepare three-minute pitches for projects they’d like to spend the rest of the semester researching, developing, and hopefully implementing. In Spring 2014, 15 ideas were presented, and eight survived. Students were then assigned to groups based on how they’d ranked the ideas. The groups usually consist of three students, each from different disciplines. There are new ventures like “Sariwa,” the Tagalog word for fresh, which works to create healthier versions of traditional Filipino food. This group recently ran a pop-up restaurant for an evening at the La Peña Cultural Center in Berkeley. Other groups took on clients. The “Building Brand Advocacy” team works with Revolution Foods, an Oakland-based company that provides healthy and affordable meals nationwide for grades K-12. The next step is to let the students navigate obstacles on their own. Multiple experiences and willing to experiment helped Jones and his group select a client. At first, the group thought about trying to connect restaurants to local farmers and cut out the middlemen, therefore decreasing prices. But eventually they decided to redesign the Heart of the City farmer’s market in San Francisco method of collecting and processing money from Electronic Benefit Transfer (EBT) purchases. “The systems in place are inefficient,” says Jones. Under the current model, EBT users are given color-coded tokens to use at farm stands. The chips are different from the ones used by credit card-bearing shoppers. At the end of the day, these tokens are returned to Heart of the City staff who sort through them by hand. “Part of our goal here is to disseminate ideas into the School without us shaking our hands in the air and trying to make a fuss about it,” says Hosang, who hopes that more courses and departments will embrace the design approach to problem solving. And while food has been a very successful topic, the theme will only be around for two more years. By then, Hosang expects courses in epidemiology or policy might find ways to include food in their discussion, leaving his team to focus on something new. “We don’t do things more than three times. In the past when I’ve done things a fourth time, I’ve been bored,” Hosang says with a chuckle.